I am also a science fiction fan. My favorite part of the movie is not when they defeat the hostile aliens, but when the crew gathers around to eat, envying how the computer always provides the spaceship crew with neat little compartmentalized meals. If only I had a spaceship that would make my dinner, I used to think, I could eat well. So, this led me to the answer for me: To figure out how to eat like an astronaut. I found if I could open my refrigerator and find the equivalent of astronaut-packed meals, I would have my problems solved. First, I bought a “smart” pressure cooker. Mine is an Instant Pot, but there are many on the market. It was well under a hundred dollars. The next thing I got were meal prep containers. These are like the plastic sectioned trays frozen dinners come in, with snap-on lids. They can be used and washed seven or eight times before they start to crack, and they are about eight dollars for a pack of fifteen or twenty. I like the two-section ones, but they have ones with three sections as well. I make both lunches and dinners for myself in the astronaut style packs. I reserve a couple of hours on Sunday to get them together for the week, and I’m all set. I’m going to give examples of a dinner I make, and a lunch. I have a variety in my repertoire, and once I got going I found could rotate them around so that there were always some in the freezer and some in the fridge so I wouldn’t have to eat the same thing every day, or make a bunch of different things on my Sunday. I have it down so I make one batch of dinners and one batch of lunches each Sunday. For a typical lunch, I do a wrap. I like the spinach and herb ones. I don’t like mayonnaise, so I use fat free sour cream for the “glue,” which you need to hold them together. You can also use hummus or plain Greek yogurt for this, it just has to hold it together. I start by putting down the turkey or ham, and then put in strips of carrots, cucumbers, or whatever vegetables I like. I do like a little crunch to them, and lettuce will wilt so I found the strips of raw veggies worked better. I sometimes throw in strips of cheese, black olives, cherry tomatoes…you get the picture. These get rolled up, cut in half, and put in the big section of my meal prep tray. I tried a handful of crackers in the small section, but the moisture from the wraps gets them soggy after a couple of days, so I use something already wrapped up, pre-wrapped crackers or fig bars. The lunches then get popped in the fridge and I have lunch ready to grab and put in an insulated bag as I’m heading out the door for work. An example of a dinner I make is spaghetti and meatballs. Here’s where the pressure cooker really makes this come together. I pour in a jar of spaghetti sauce and two jars of water, a package of dry spaghetti (broken in half once so it fits in the pot), and a bag of frozen meatballs. I put the lid on the cooker, cook at high pressure for eight minutes, and the spaghetti and meatballs are magically ready when the lid comes off. I portion that out into my meal prep containers, and then steam broccoli for my side vegetable. This takes 45 seconds in the pressure cooker, and gets put into the small section of my container. Half of the meals go in the freezer, half in the fridge, where I already have a few beef stews, chicken and mushrooms, and some of the other meals I’m rotating through out of my frozen stockpile from previous Sundays. Total prep time for all of this, lunches and dinners, is around two hours, sometimes less. YouTube is your friend. You can find lots of pressure cooker recipe books, but there are hundreds of people using pressure cookers who have great recipes you can watch them make for free. Put in the specific brand name of your cooker and “recipes” in the search bar of YouTube and you’ll be presented with a cornucopia of meals you can make in five or ten minutes tops. Pinterest also offers lots of healthy instant pot recipes. The food prep containers are as important for eating this way as the pressure cooker. If I have a big serving container of a few day’s worth of an entrée in my fridge, I will probably look at it, think about dishing it out and putting it with a vegetable, also in a big bowl, and decide it’s easier to just have a bowl of cereal (yes, I will admit to being that lazy). If it’s one of my astronaut meals, I will happily grab it, stick it in the microwave for a minute and sit down to a healthy meal. I don’t even have to dirty an extra plate. I get meal prep containers that are dishwasher safe, but I will say that they will fill up a dishwasher in just a couple of days. I usually hand-wash mine after my meal at the sink with a brush and some soap and throw it in the dish drainer. By Sunday, I have a clean stack to fill up again. Plan. Always know what your meals for the week are. You want to go into your Sunday session with all the ingredients ready and knowledge of what’s going in those meal prep sections. As I said, I make one set of dinners and one set of lunches per week. I have seven or eight entrees and make either wraps or chef’s salads for my lunches. I have cards for these that I take to the grocery store that have the shopping-list items already on them so I can be so lazy that I don’t even have to write out a list. Be patient while you build up your stock so you can rotate meals from freezer to fridge and have a variety. In the beginning you are going to have to put up with repeats. But it only takes a month to six weeks to more towards no repeats in a week (I am happy for repeats on some of my absolute favorites). You’ll learn to fine tune this as you go. In the beginning, you will probably buy more ingredients than you need, or end up with one of your compartments full and the second compartment with not enough of a side or a vegetable. Make sure you don’t keep too many dinners in your fridge. I put six meals in on Sunday, and this leaves me a day that I eat out or get take out if I want it. I want to make sure the meals in the fridge are fresh and new, and don’t sit long enough that they go past when they are good to eat. When I started this project, I didn’t realize what a difference it would make in how I eat. I definitely didn’t realize how much cereal I was going through, or how many times I was grabbing take out or fast food. Once I broke myself of my bad habits, it was jarring when I’d get busy and return to them—Taco Bell really isn’t as good as you used to think it was, when you’ve been away and eaten good food for awhile. I have found that eating this way is more economical than preparing a full meal the traditional way, much more economical than frozen dinners (Lean Cuisine, Smart Ones), and much cheaper and healthier than take-out. Since I have my prebuilt shopping lists, when non-perishable items you use in your repertoire go on sale, you can grab a few extra cans, jars, or bags of what you use and sock it away. 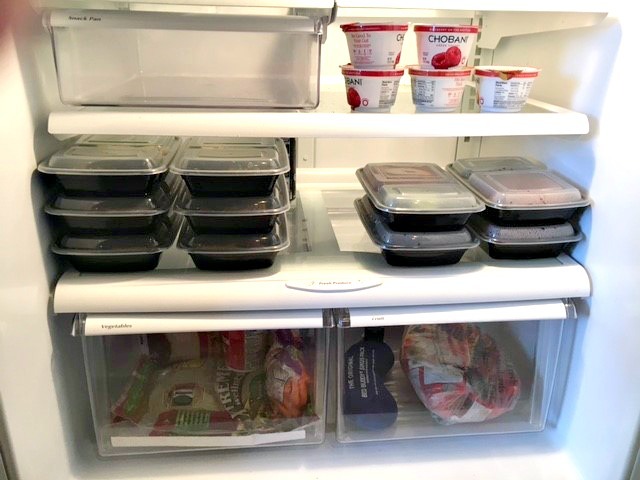 So my fridge is now my space-age meal dispenser, through the technology of a “smart” pressure cooker that makes cooking almost like a game, my meal prep trays, and a little planning. Now I can be as lazy as I want to be and still eat good things. Even better, this form of eating has built-in portion control, so I also don’t overeat and gain weight. As far as lunches and dinners are concerned, I’ll never leave this mothership. Love your idea. It sounds simple once I get used to the routine. I like to eat healthy and feel so much better when I do. I’m married and retired, do a lot of volunteer work and stay pretty busy. However, my hubby had a lot of health issues and I’ve found myself going to a lot of dr. appts, with him, eating out more and generally getting pretty lazy about even taking daily walks with our dog. You’ve given me the incentive to make some healthy changes. That is fantastic, Meg! Let us know how it goes once you try this idea– you could be featured as our next blog! 🙂 Keep up the great work!! This is an awesome idea. I have thought of preparing foods ahead of time but didn’t quite know what to do. This article gives me a great head-start with this. Thanks! Can’t imagine fresh food staying fresh for a week! None of the containers I’ve purchased have accomplished that. What kind of containers do you use?? I have just started trying to do meal preps, at least for myself, and so far so good. But the Instant Pot sounds like it makes it even more simple. Last night I did some meal preps, just for lunch, and it took about 2 hours and a lot of chaos. I need all the ideas I can get so I can get my blood pressure down. Thank you for the great ideas!! Great way of making healthy meals fast and affordably! I especially like having ingredients for meals listed on separate cards. 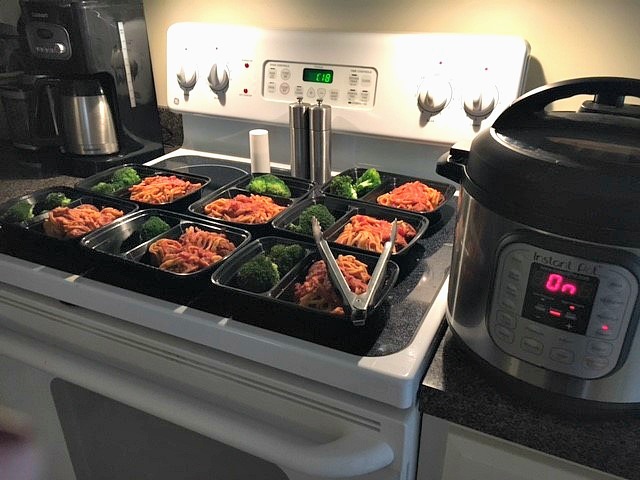 Thanks for sharing your meal prep process! I Love it!! Please share more of your recipes. I am definitely going with the wrap meal instead of buying at fast food joint. Love this– Thank you for the inspiration! Where do you find the containers? I don’t recall ever seeing something like this at the store.